RhythmBrain is a set of interactive multisensory brain exercises. 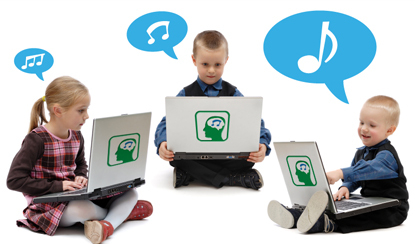 Each exercise simulates music reading and performance, activities which accelerate brain development. Try our sample at the Examples tab. Just say the names of the images in the rhythm indicated. After you have done that at a relaxed speed, kick it up to a challenging speed. Notice the "load" on your brain. That feeling is the result of a challenge to your brain, and your brain is trying to adapt. It is beginning to make new connections that will allow it to perform what you are asking it to do. Consistent use of our program builds the brain's ability to synchronize the neuron firing and receiving that is required for paying attention. You get an online subscription to use at home. We recommend a minimum of one hour per day - three days per week. However, all accumulated brain exercise is worthwhile. The result is 90 days of fun lessons designed for family activity. Parents can address the symptoms of most learning disabilities through development of the brain with proven exercises. With the parent's encouragement and help, the child can develop . . . Does RhythmBrain change the brain immediately? RhythmBrain is challenging brain exercise. It is one method of purposefully exercising the brain. Just like push-ups begin to change muscles immediately, RhythmBrain forces the brain to adapt immediately. The outward evidence of change takes some time. Changes in brain functioning should begin to change behaviours in about 90 days of consistent use of the RhythmBrain material. rain. That feeling is the result of your brain trying to make new connections that will allow it to perform what you are asking it to do. Attention Deficit Disorder, Dyslexia, Autism, and related conditions still hold great mystery to the fields of psychology and education. No one can promise a cure. RhythmBrain provides the brain hours of practice in spatial temporal recognition, image identification, verbalization, and rhythmic performance. Research has proven that each of these skills contribute to reading, language fluency, and learning in general. In addition, such practice forces the brain to deal with time - the fourth dimension of our world. Each of the disabilities mentioned above involves the relationship of time with a person's experiences. We believe that practice in this area can play a part in modifying, eliminating, or avoiding the effects of harmful learning disabilities. Both Magnetic Resonance Imaging and post mortem examination have shown that the brains of accomplished musicians are different than those of non-musicians. Through the process of reading and performing music, musicians develop brains that are more active, more perceptive, larger, and developed to a higher degree. In addition, the right and left half of a musician's brain are more directly linked to provide a better opportunity for whole-brain thought and analysis. RhythmBrain lets a family begin that development process as early as a child can speak. In fact, our program was developed by musicians to simulate music reading in activities for the very youngest children. We believe that through RhythmBrain, pre-school children can begin to reap the brain development benefits that accomplished musicians enjoy, and older youth can deal with learning disabilities more easily. RhythmBrain is a set of interactive multisensory brain exercises. Each lesson is based on a creative theme to keep the learning process fun and engaging. Set the tempo slider to the left of center to start slow and learn the exercises. As participants progress, increase the tempo to make the lessons more challenging. Rhythm therapy can increase an individual's ability to concentrate and work toward completion of predetermined goals. Each exercise simulates music reading and performance, proven stimulants of brain development. RhythmBrain lets any parent play an important role in the development of a child's brain. By leading the family through RhythmBrain's fun activities, parents or guardians can know that every child gets some of the best mental stimulation available. "The researchers concluded that ‘music therapy seems to have an effect on personal relationship, emphasising positive benefits of active listening and performing, and this in turn sets the context for developmental change.’ It was also suggested that the hand-eye coordination which was required by the children when playing music was ‘a significant role in developmental changes’. "People with diagnoses on the autism spectrum often show a heightened interest and response to music, making it an excellent therapeutic tool to work with them."